A healthy lifestyle involves many choices. Among them, choosing a balanced diet or eating plan. So how do you choose a healthy eating plan? Let's begin by Dr. Zuckerman has excellent "people skills." He really takes his time with his patients. And he has a great sense of humor! Great experience. Dr. Zuckerman has excellent "people skills." He really takes his time with his patients. And he has a great sense of humor! Great experience. I was a little scared to have fillers done for the first time, but Dr. Zuckerman put me at ease right away. He told me all about what to expect from having Restylane injections done, and really spent a lot of time answering my questions. It really didn't hurt at all. Dr. Zuckerman has a real gentle touch. When he was finished, he handed me the mirror, and I couldn't believe the difference!... I've seen Dr. Zuckerman for help with various skin problems for the last two years. He is extremely knowledgeable, very friendly, and really takes his time to make sure all my questions are answered. His office staff is also very helpful and friendly. I recently tried Botox with Dr. Zuckerman for the first time, and the results I got were amazing! I am so pleased. Would recommend him highly! Very friendly and professional staff. Making an appointment was very easy and I was seen immediately. Dr. Jordan has great bedside manner. His nurses and assistants are all very friendly and caring. At times it can be a long wait to see him. Try to book it earlier in the day. There are multiple doctors so you may see people go in first but signed in after you. Do check with reception though. They forgot about me once because my file wasn't placed where it was supposed to. I go back every year for my skin check up. He also took care of a large deep mole and an ear rash. Now my mother goes to him. We are very pleased. I left out one star only because of the wait at times and lack of parking. Residential parking is tough with All the parking rules. Excelent facility, professional staff and expedient yet thorough service. It does get busy from time to time, but the wait times have always been much shorter than at an average doctors' office. Some have reviewed the front desk staff less than favorably, that however has NEVER been my experience, and I have visited the facility a number of times. I have been seen by Dr. Zuckerman on more than half dozen occasions and I have always been pleasantly received and treated by EVERYONE. I highly recommend The Dermatology Center, and I personally intend to continue going there for the foreseeable future. Dr. Zuckerman is one of the best dermatologists I have been to. He is extremely efficient and knows how to make a patient feel calm with any issues. I have seen the Physicians Assistants Phoebe Tam and Leo Yagudayev as well. They are great and helped me out a lot. I definitely recommend this office and will continue going here. Dr. Zuckerman in an excellent dermatologist. I have been going to him for many years and am extremely satisfied. Dr. Zuckerman is the best dermatologist I've ever been to. I've been going to him for years for his expertise, as well as his very friendly and comforting manner. His staff is great too--professional, efficient, and friendly! I wouldn't go anywhere else for my skin care. He found a melanoma on my back on one of my routine skin checks, and basically saved my life. Thanks Dr. Zuckerman! This is my second review because I cannot find out how to edit my prior review. Dr. Zuckerman is a qualfied and knowledgeable doctor. There are issues in the wait time but he said they are addressing those issues and hopefully it will get better. My whole family has been going to Dr. Zuckerman for years. He's been great, taking care of several different issues for us professionally, with a gentle touch and a sense of humor. His assistants, Anna and Maria, couldn't be more helpful, supportive or kind making sure we're comfortable and helping us navigate insurance and medications. PA Phoebe Tam saw us several times for urgent matters, again with skill and compassion. Getting those urgent appointments as soon as possible for us were the very friendly and helpful front staff, Viscody, Myra, Mimi and Jenna. It's really nice to go to a doctor's office where they greet you by name with a smile when you walk in, even when the phones are ringing and the office is full. Dr. Zuckerman is an AMAZING dermatologist! He is very knowledgeable, kind, and really takes the time to answer all your questions. He found an unusual looking mole on my back which he biopsied. It turned out to be a melanoma. I'm so glad that I came in for my twice a year skin check so that he was able to remove it in time. I am very grateful to him. I would never see another dermatologist. Thanks so much Dr. Zuckerman! Excellent experience! Dr. Zuckerman is warm, friendly and very professional! I feel very comfortable with him and know that I am with the best! A visit to Dr. Z's office is always a very positive one. As soon as I enter through the door, I'm greeted by a friendly and caring staff. The wait is never too long and is always worth it. Dr. Z's bedside manner is superb. He always answers any questions that I have and makes me feel very comfortable. I especially like one of his assistants -- I believe her name is Anna -- who is always very helpful and caring! Overall, my experience visiting Dr. Z is always 5-Star! If you have nothing better to do than wait and listen to the front desk girls yapping, then this is the place for you. But, besides all this negative remarks, the doctor is awsome. Follow up visit after 3 weeks. Things changed a lot ... I had a wonderful experience at this practice when i'm in really needed an appointment with a dermatologist nearby. I loved entire process. Staff wasn't great. By the time i saw doctor Zuckermam, I really was at my wits end with dermatologists . Ive seen 4 in the past 6 months, two of which prescribed the wrong medications. I suffer from rosacea . I had a terrible flare up and was in terrible pain discomfort and embarrassment. I was very impressed with Doctor Zuckermam clinical assessment and bedside manners. He took time to look at my face , took swabs for testing. I was amazed . The meds are on point. Feel 100 % better in less than a week. Awesome doctor and staff. I did wait about an hour before seeing him but ot was more than worth it! 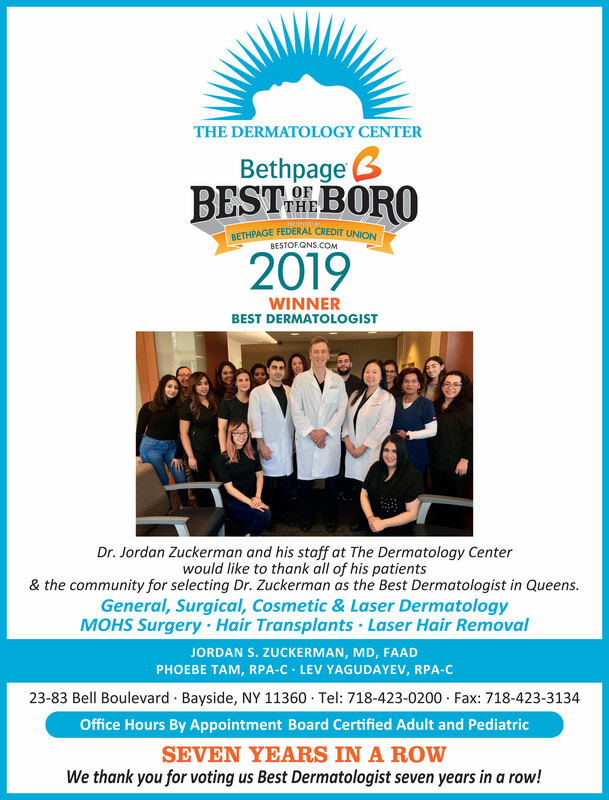 Best service Dr. Zuckerman Bayside Dermatology is the best dermatologist I've been to by far. They are so nice and the level of professionalism is exceptional while they still manage to project a friendly and comforting atmosphere. The entire staff explain things well and listen to all your concerns and questions without rushing you. They make sure you leave with no confusion at all. The entire staff at this office deserves the highest recognition for their efforts. I can't express how genuinely satisfied and impressed I've been with this office. I HIGHLY RECOMMEND Bayside Dermatology to anyone looking for a GREAT dermatologist. I went in with a concern over losing my eyebrow hair and was met with a team that was ready to match my concern with proper and sufficient care. Dr Z and his staff took me in as quick as possible and worked with me by asking me questions and examining the area of hair loss until a proper diagnosis was made. After I was diagnosed with alopecia areata, Dr Z gave me the best methods to treating my skin condition. When he gave me shots in the infected area I felt little to no pain!!! It was truly an amazing experience. The office manager Nina also gave me free samples of the creams I am supposed to put so I can have some time to go to the pharmacy and get my prescription in. Truly an amazing office with an amazing staff and dermatologist. I have been coming for several months and always a great experience. I have never waited more than 10 minuets. Thank You I've been a patient at Dr. Zuckerman's office for 5 years now and he absolutely great. He is very thorough in the room and takes the time to explain everything. The staff is very friendly as well. My entire family goes to the dermatology center and I refer him to everyone! Thank you Dr. Zuckerman and his staff are very friendly and helpful. It's obvious that everyone in the facility is very well-trained and experienced. The wait time is always short. I've seen Dr. Zuckerman a number of times and always get great results. He always prescribes me the right medicine and with enough refills. He is an extra-ordinary physician! WOULD RECOMMEND 10/10 Dr Zuckerman is one of the greatest Dermatologists I have ever been too. He has helped me treat my skin problems over the past 6 years. I refer him to all my friends and family. Go to his office you will not be disappointed! Thank you Dr Zuckerman and his staff! I've seen Dr. Zuckerman for help with various skin problems for the last two years. He is extremely knowledgeable, very friendly, and really takes his time to make sure all my questions are answered. His office staff is also very helpful and friendly. I recently tried Botox with Dr. Zuckerman for the first time, and the results I got were amazing! I am so pleased. Would recommend him highly! I recently had an office visit with Dr. Zuckerman at The Dermatology Center. I have been suffering from a dermatologic problem for several years. I have been to many different dermatologists over the years. First, Dr. Zuckerman diagnosed my problem immediately. He then started me on a medicine (one that I have never used) and it has been 2 weeks and I can't believe the improvement I am seeing. I am so glad I found Dr. Zuckerman. I look forward to going back for my follow up visit. The staff there was so nice. Not only the medical assistants but the front staff too!! Dr. Zuckerman is super friendly and so pleasant. I highly recommend The Dermatology Center!! Dr Zuckerman is one of the greatest Dermatologists I have ever been too. He has helped me treat my skin problems over the past 6 years. I refer him to all my friends and family. Go to his office you will not be disappointed! Thank you Dr Zuckerman and his staff! Copyright © Jordan Zuckerman MD. All Rights Reserved.